This move may free us from legacy systems and resources that inherit and perpetuate geospatial inequities, those subject to periodic cycles of spatial obsolescence. We will all experience a period of adjustment (no pun intended), but beyond that we will reap unexpected benefits, directly and indirectly. The general populace may not recognize the term “geodesy,” but they are increasingly aware of the subject. Average folks are exposed to global references every day with that little consumer device in their pockets or on their wrists. As such devices become more accurate, folks start to notice that the little blue dot is not lining up with where they expect it to be. Many people now realize that GNSS positions are not necessarily “wrong” (imprecise), but the problem is that, for instance, the line on the assessor’s map on their screen is more than likely “off” (spatially out of date). When mainstream news announced that Australia was updating their mapping references to match the shifting continent on January 1, 2017, people understood there was a need to catch up (nearly 6 feet) to sync with current, GNSS-derived positions. This reality is also supported by news stories like that of a bridge being built between two offshore platforms that was misaligned because no one had accounted for the nearly 30cm global shift over 10 years. What if our world operated in a geospatially synchronized manner? What if the dynamics of time-on-position were always accounted for? We are entering, finally, a future of dynamic positioning. We gave a nod to this new era in naming our publication. 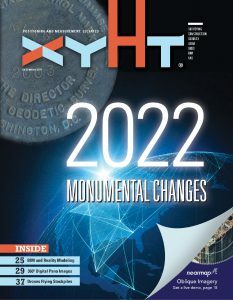 I hear folks say, “Hey, we like x-y-height magazine.” It is actually x, y, H (big H for orthometric height, to be nitpicky), and t for time. The future emphasizes this fourth dimension. If you think, “this will affect only surveyors,” think again. Being able to resolve highly precise positions—in real time—is essential in, for instance, BIM (read “BIM and Reality Capture” inside). Also in this issue is a profile of a Canadian firm that provides positioning and GIS solutions for the real-time management of utilities. If you’re thinking, “This will affect only surveyors,” think again. If your GIS has been frozen in time and space, you may not realize that there may have been as much as a few feet of plate velocity since you established your base layers; present-day GNSS reveals these discrepancies. The 2022 “catch up” to the global framework can also add as much as 4 feet of shift, depending on where you are in the U.S. The earth is moving. We can learn to “ride the plates” as well.